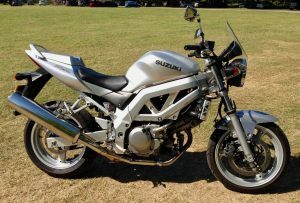 The Suzuki SV650 is one of those super underrated budget bikes that is a real wolf in sheeps clothing. It may be pretty basic with no frills, but it’s rock solid, lightweight and is a tank gripping load of fun to hustle around twisty rural roads and on track days alike. The smooth, easy ride combined with huge fun factor make it a great first big bike choice, something a novice can ride, yet not grow out of a year or two later. Their common use in the Mini Twins Race Series is testament to their capabilities. The SV650 has gone through a number of iterations over the years, do your research so you know what you’re buying. 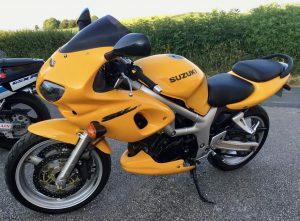 1999 – 2002: The original SV650 with carbs, jelly mould fairing (SV650S) and analogue clocks. 2003 – 2006: The SV650 was restyled with a pointier fairing, digital clocks and distinctive vertical brake lights. The engine was also given a fuel injection make over. 2007 – 2012ish: New Euro-3 compliant version with catalytic converter, twin spark engine and optional ABS. 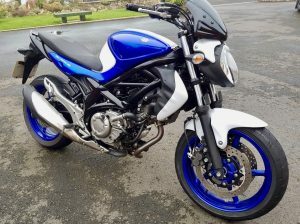 2009 – 2016: The Gladius SFV650 replaces the naked SV650; similar setup, with a nice trellis frame, Haribo styling and a slightly more efficient engine with smoother throttle. Popular with the bike schools. 2016 – onwards: Suzuki revives the SV650 with a more refined package, ABS as standard, a few rider aids thrown in and Euro-4 compliant. SV650S faired versions offer the rider a slightly more leant forward position with slightly higher pegs, whereas naked SV650 models sit the rider more upright with flatter bars. Alongside the naked and the half faired versions, 2007-2009 years had a fully faired version, either as stock or retrofitted. Economy is good, expect 45mpg on early models, 50mpg on 2007+ models and 55mpg on 2016+ models, though early models had no fuel gauge. Those early models can be had for around a grand or less, but it’s worth paying more for a good nick one. For a later 2007+ model expect to pay £2-3k, but a definite must if you’re London based as their Euro-3. There’s plenty about, so be choosy. Downsides? All were a somewhat budget bike priced cheaper the competitors from Honda and Yamaha. Suspension is basic with little adjustment available, brakes are purely adequate and some taller riders find them a little cramped. Early models were prone to noise camchain adjusters, failing rectifiers and water corroding the switchgear and electrics. However, there’s thousands about and cheap spares are plentiful. Overall, a great budge bike that’s stood the test of time with a proven track record of reliability. 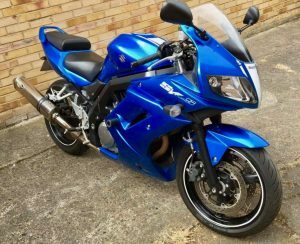 44Teeth: Why the Suzuki SV650 is the best bike. Ever.